Long or irresponsible use of chicory root can develop irritating side effects. We will focus on this later on. 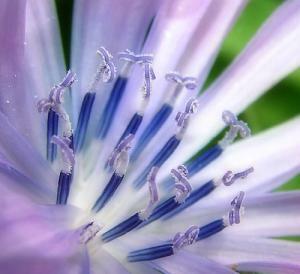 Chicory, is a wild herb also called coffee weed, blue dandelion, endive and blue sailor. Originally only found in England, it can now be found in Australia, North America and Europe. The parts that are mostly used and needed are roots and leaves and they are very popular regardless of their side effects. In Mediterranean countries and England, this herb is used as a coffee substitute. The main use for the leaves and roots is in meal preparation, such as vegetables salads and many others. In the winter and the fall, there is a special treatment for the chicory cultivation and this will create two chicory leaves types, which are "French Additive" and "Barbe de Capucin". A drink is made from chicory roots that are roasted, grounded and brewed in order to be used as coffee. The bitterness of coffee and tea can be increased with the roasted chicory roots. There are some probiotic and sedative properties of chicory, but they are also associated with relief from the appetite loss, cardiovascular diseases, diarrhea, cancer, constipation and several other diseases. Some side effects are associated with chicory and we will see which. However, chicory root can trigger various side-effects in certain situations. Contact dermatitis is the most common one, while some other possible side effects are skin irritation, itching and hives. Direct contact is the most common way of detecting these side effects. We advise great caution when taking chicory supplements for those who are suffering from gallbladder diseases such as gallstones. Also, see a doctor if you are taking some other medications regardless of the fact that no connection between some medications and chicory side effects has been made. Nursing women may experience some side effects, too. Untimely menstruation can also be a side effect, along with the abortive and contraceptive effects discovered in researches done on rats. Women who are breastfeeding or pregnant should see a doctor before using chicory. Furthermore, loss of vision and blurred vision can be caused by the long-termed use of chicory root. Therefore, you are advised to be very careful when opting for enjoying this plant. People who are used to drinking coffee with caffeine over a long period of time, usually have problems with addiction. Of course, it is not the same as in the cases of drugs or alcohol addiction, but the body gets used to caffeine and it cannot function properly if the coffee has not been drunk. It can be even worse if one likes to sweeten the coffee with sugar. Then it affects the blood pressure quite severely. The addiction develops slowly, unnoticed and you are practically not aware that it is there. All that caffeine which is taken in might cause the heart to start working faster. Caffeine consumption usually goes hand-in-hand with cigarettes and the two make a filthy habit that can ruin one's health, lungs especially and lead to some serious conditions. Decaf coffee is different, because it does not trigger addictions. Nevertheless, it gives a real boost of energy, which is important for people who work long hours, or those who have to get up early. When regular and decaf coffee are compared, the taste and the smell are the same. There are a lot of forms of coffee in the natural and unadulterated forms of decaf coffee and it really suits people who like to consume food in their natural form and shape. A conducted research of the effects of decaf coffee on flow mediated dilation showed that people who consume decaf coffee have a reduced risk of cardiovascular diseases. The study was conducted on a group of healthy men and women and the results revealed that one cup of decaf coffee increases flow mediated dilation, which is good. In the future, more studies about the benefits of decaf coffee need to be done and a comparison should be made between coffee with caffeine and decaf coffee. Of course, we have to bear in mind that decaf coffee does contain smaller amounts of caffeine. Therefore, you are advised to keep your consumption levels moderate and not to go overboard with drinking this kind of coffee. All in all, both chicory root and decaf coffee are great substitutes for coffee and people choose these in order to avoid the potential adverse effects of this drink or increase the refreshing and alertness-boosting of it. Chicory root is known to trigger numerous side-effects while decaf coffee, containing caffeine in small amounts may be dangerous when consumed excessively. Therefore, decaf coffee is a healthier choice for enjoying coffee in a healthier way. So, make sure you play it on the safe side and get only the best from both of alternatives. Which coffee has the least caffeine? Giving up caffeine to lessen panic attacks?